His students knew him as “Judge Alex.” His friends and masonic brothers knew him as “Jim Pat” or just “Jim.” Texas knew him as an unforgettable leader. James Alexander was born to a farming family in Moody on April 21, 1883 and he was educated in the public schools there. While he achieved numerous accomplishments in his life, he always continued to farm and was well-known in beekeeping circles. He arrived at Baylor in 1901 and received a bachelors degree and then went on to acquire a law degree from UT in Austin in 1908. In order to pay for law school, he taught at an Austin public school. 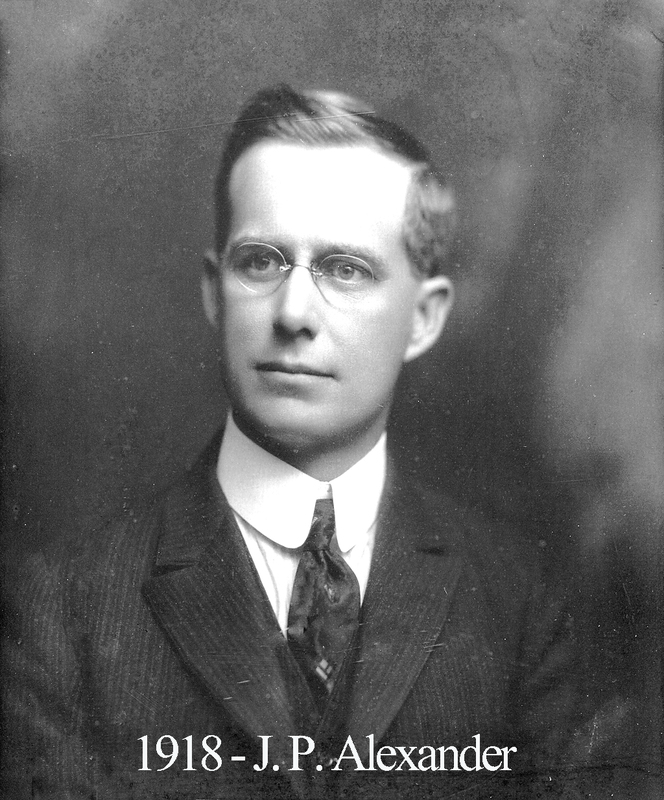 Alexander began his law practice in McGregor but moved to Waco in 1911. He would gain the community’s respect as a lawyer, judge, and teacher. Bro. Alexander was made County Judge 1916 and then District Judge in 1920. From 1931 to 1940, he was Associate Justice of Waco’s Court of Civil Appeals. In 1940, Alexander was elected Chief Justice of the Supreme Court of Texas. All the honorable titles bestowed him never made Judge Alexander lose sight of his compassion. As early as 1917, he gained a reputation for mentoring juvenile offenders that appeared in his court by inviting them for dinner at his home and offering them advice. He would also be remembered for his efforts to render the appellate system of Texas courts more efficiently, thereby making the legal process in our state faster and of greater clarity. From its creation in 1920 to 1940, Baylor Law School employed Judge Alexander as professor of civil law. His students knew him as “Judge Alex.” A their instructor, Alexander created a mock court system for them to get their feet wet in practicing law proceedings. It was one of, if not the absolute, first such mock trial group of any law school in the nation. He was a member of the ultra-exclusive Philosophical Society of Texas, director of the State Bar, and president of the National Council of Judicial Councils. He ascended to the East at 92 in 1917 and our Lodge was in the midst of an unbelievably rapid growth spurt. For example, one month saw Alexander open the Lodge thirty different times and it was typical for him to have the Lodge open for degree work every weeknight from 6pm to 1am. On Saturdays, the Lodge would often be convened from 12:00pm until 12:00 am. “The State of Texas has lost one of its most distinguished citizens, jurists, and public servants in the untimely passing of Chief Justice James P. Alexander. His service as presiding judge of the highest court of his State was characterized by dignity, fairness, and wisdom consistent with that exalted place. His opinions were carefully drawn, reflecting deep study, profound knowledge of the law, and sympathy for the inherent rights of man. Never failing in diligent attention to the demands of public service, he took time which properly might have been his own to give large service also to many civic affairs and to every movement for the promotion of the well-being of his fellowmen.